Exercise builds your heart muscle, as well as your skeletal muscles. A strenuous workout makes your heart pump faster and the amount of blood circulating increases. 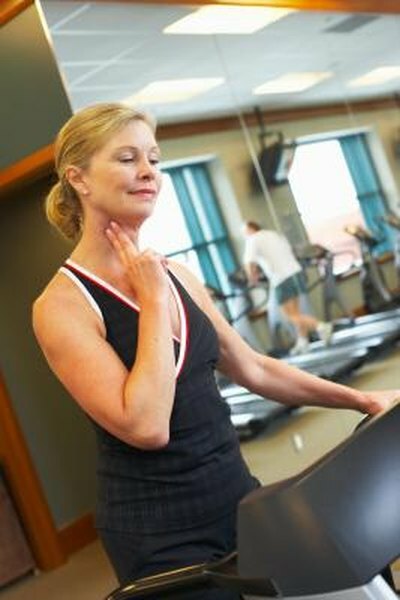 This increasing heart rate allows more oxygen to flow to your muscles and more carbon dioxide and metabolic wastes to be carried away. As you become more fit, your heart muscle works more efficiently. Checking your heart rate recovery is one way to gauge improvements in your fitness level. Heart rate recovery is the length of time it takes for your heart rate to return to its baseline after an intense workout. You need to know your resting heart rate and your target heart rate. Once you have completed a workout in your target range, measure how long it takes for your pulse rate to return to the pre-workout rate. This is your heart rate recovery. If you're very fit, it's quite short. If you're just working out, it takes longer for your heart to recover. Check it every four weeks to see how much you've improved. As your heart muscle becomes stronger, it can pump blood more effectively. Each contraction of your heart muscle muscle forces more blood through your circulatory system. As you continue to train, your blood volume increases. This increase allows more oxygenated blood to reach your muscles and gives your heart more volume. So a stronger contraction with higher volume of blood increases the amount of oxygen and nutrients circulating in your body. As you work out and increase your fitness, the conditioning of your heart muscle increases and your resting heart rate decreases. The amount of oxygen and nutrients that your body uses at rest does not change when you are in good condition. Your heart does not have to pump as many times to deliver fresh blood to your cells, organs and tissues when it is contracting more forcefully. When you begin to train, your heart is beginning to build muscle as well. It has not yet made adaptations in contraction strength, and your body has not yet supplied a higher volume of blood to circulate. Measure the amount of time your heart takes to return to its normal rate after a workout as a baseline. As you build both heart muscle and skeletal muscle, you will notice your heart rate recovery time shortens. Your heart has become more efficient and your muscles are getting a larger supply of oxygenated blood with each contraction, so your heart does not have to work as hard. More exercise permits you to work at a higher intensity for a longer period, and also translates to a healthier heart when you're not working out. Cycling Science: What are the Effects of Training on Heart Rate?